We add SingTel and remove Cityneon after the latter’s strong outperformance. Our September alpha picks saw mixed performances. Cityenon was outstanding, rising 15% mom, whereas there was profit taking in Tianjin (- 4.4% mom) after rising 13% in August. SATS and Thai Bev consolidated 5% and 3% respectively but we remain confident of their prospects and see accumulation opportunities at current levels. Both Memtech and Wing Tai outperformed the FSSTI and delivered absolute returns of 2% and 1% respectively. SingTel in and Cityneon out as we lock in profits. We add SingTel on expectations of a potential special dividend in November and to reflect a more defensive stance in 4Q17 after the FSSTI’s 12.7% ytd rise. While we remain confident of Cityneon’s outlook and have a BUY and target price of S$1.50, we remove it from our list following its 15% outperformance since its inclusion into our list last month. Potential special dividend after the successful listing of Netlink Trust in Jul 17. We estimate a special dividend of 9 S cents/share, based on 65% payout of the IPO proceeds. Telkomsel continues to maintain double-digit growth in subscriber base and revenue growth from voice and data. Bharti should start to recover in FY19 due to industry consolidation. Maintain BUY and DCF-based target price of S$4.53 (6% required rate of return and 1.5% terminal growth). Share Price Catalyst Event: Potential announcement of a special dividend together with its FY18 interim results. Timeline: Release of 1HFY18 results, expected in mid-November. BUY with RNAV-based target price of S$2.61. Our target price is pegged at a 25% discount to our RNAV of S$3.48/share. Wing Tai is trading at 0.52x P/B (lowest within our coverage) and a deep 39% discount to our RNAV. Wing Tai has a low gearing of 2.4% (lowest within our coverage), positioning it well to deploy its sizeable debt headroom of S$1.5b (assuming comfortable net gearing level of 50%). We believe Wing Tai will further deepen its footprint in Singapore, Malaysia (post privatisation completion) and Australia. Share Price Catalyst Event: Launch of the recently-acquired Serangoon North Avenue 1 site. Wing Tai plans to develop over 600 homes on the 99-year leasehold site with a GFA of 462,561sf, situated within a mature residential estate in the Serangoon Garden area. We also see potential for Wing Tai to buy more landbank given its S$1.5b acquisition headroom. Timeline: Potential 6-9 months for landbank acquisition or launch of its Serangoon North Avenue 1 site. See report: Property − Singapore - The Next Wave. Possible beneficiary of Qantas’ return to Changi Airport after a five-year hiatus, making Changi its largest hub outside of Australia. SATS is already providing catering and ground handling services to Qantas’ sister airline, Jetstar. SIA’s pax yields have shown sequential improvement for two quarters, with yield declining just 1.9% yoy in 1QFY18. SATS’ inflight catering ASP will likely stabilise in the coming quarters as pressure on airline yields abates. We expect SATS to benefit from higher gateway services revenue, driven by strong global cargo volumes. We think SATS is a better play compared to SIA on stabilising pax yields or higher cargo throughput given SIA’s exposure to volatile fuel prices. Our target price of S$5.40 implies FY18F PE of 23.5x and dividend yield of 3.5%. Share Price Catalyst Event: Higher cargo volumes, stabilising inflight catering ASP. Timeline: Release of 2QFY18F results in November. We expect increased sales volumes in 4Q17 as sales agents typically build up inventory ahead of excise tax hikes. Also, there could be margin expansion as THBEV is able to pass through 100% or more of the excise tax increase to customers through higher ASPs. We have a SOTP-based target price of S$1.09. THBEV is trading at 20.0x 2017F PE, which is still lower than the global average of 32.7x 2017F PE for spirits peers, 23.7x for beer companies and 27.5x for NAB companies. Share Price Catalyst Event: Recovery of alcohol consumption will likely enhance earnings for 4Q17. We also expect increased sales volumes in 4Q17 prior to the excise tax hike in September and the end of the mourning period. Timeline: 4QFY17 earnings release in November. BUY with a US$1.66 target price, based on peers’ average FY18F PE of 15.5x A renowned TCM pharmaceutical giant, TJZX presents a unique opportunity with a deep discount between its A- and S-shares. The latest reforms could unlock great value with delisting possible while its strong brand equity and R&D efforts (851 patents) make it a winner in a growing TCM pie. We expect ASP hikes to lead to a 14.9% net profit CAGR in 2016-19 with 2018 net cash of US$0.17/share and 3.8% yield. Share Price Catalyst Event: Earnings/dividend upside or M&A newsflow. Timeline: 3Q17 results as higher ASPs gradually flow through to earnings, and potential upside from SOE reforms. Memtech’s R&D team specialising in material sciences has given the company a competitive edge in this industry. The company holds more than 120 patents. Its crown jewel is its manufacturing process for liquid silicone rubber (LSR) which allows it to break into the Beats by Dre supply chain. Our channel checks indicate Memtech is one of the world’s leading precision engineering manufacturers of LSR products. Maintain BUY and target price of S$1.15, pegged at sector FY17F PE of 12.5x. Share Price Catalyst Event: Better-than-expected earnings. Timeline: 3Q17 results in November. We have a street-high DCF-based target price of S$1.10, implying a 43% upside. Citic Envirotech is the best in class with superior technology know-how protected by a suite of intellectual property rights. Riding on favourable industry dynamics and the entry of a new strategic shareholder, investors can look forward to new areas of growth in river rehabilitation, sludge treatment and the circular economy. Share Price Catalyst Event: Potential contract wins that could underpin FY18 earnings. Timeline: 3-6 months as clean water is a high priority for the Chinese government. This would benefit the company, which has an impressive track record and technology. 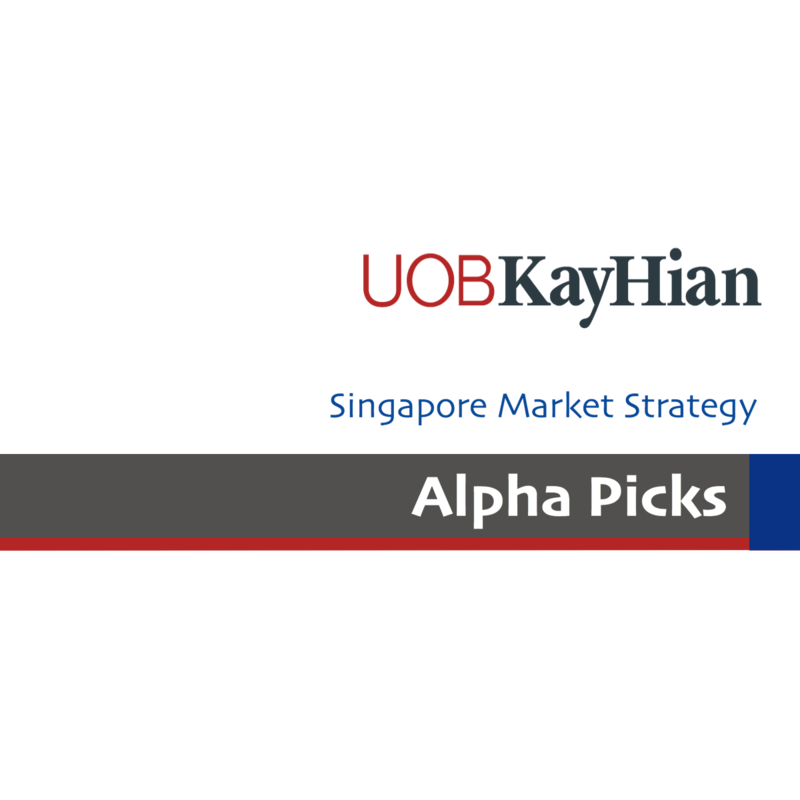 * Alpha Picks - Stock picks with a timeframe of 1-3 months and not UOBKH’s usual 12-month investment horizon for stock recommendation.